So, Deity Quest has been out for almost a month, and we've been getting a lot of great feedback! Using many player suggestions, we have developed Deity Quest v1.1.4 - the first major update since launch! One of the biggest problems players had was figuring out what was going on during battles - with many followers attacking at the same time, the battlefield becomes chaotic. Additionally, type modifiers end up being forgotten, as it's just too hard to see which type is strong against which other types with everything going on at once. Unfortunately, because of the way multiplayer battles work, this mode will not be available during multiplayer battles. Speaking of multiplayer battles, I have finally set up a public server! There are two - one called "David's Sever v1.1.3" and "David's Server v1.1.4". The servers will only accept clients of the same version, as there have been some balancing changes. However, the v1.1.3 server will remain up indefinitely in case people are still using an old version. Anyone with the extended edition, feel free to log in to the server and fight friends without having to set up your own server or LAN party. 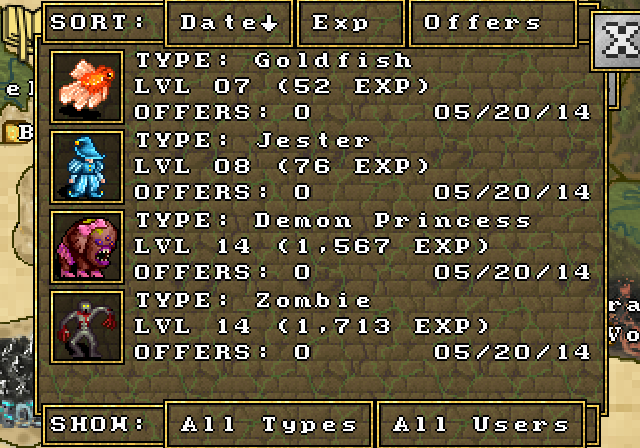 I've also put some of my mid-level followers up for trade, including one unique follower (the Demon Princess)! You can view trades by clicking on DQDB/Net in the extended edition and then clicking "View Open Trades." Why doesn't anyone want my Demon Princess? Isn't she cute? As for showing type modifiers, when "Show Every Attack" is enabled, a message is displayed whenever an attack is effective or ineffective! Only one of these messages will show at a time, so if your follower uses an area of effect attack or the attack is effective against BOTH enemy types (for 4x damage), it will only show one of the messages. However, this really helps players figure out what is strong against what, and if you notice the enemy getting a lot of "effective" hits, you may want to rearrange your followers! There have also been some smaller tweaks, improvements and balancing. For example, the Vagrant Shroom and Angel now start with non-mana consuming attacks. While they still get awesome mana-using attacks when they level up, this ensures that your starter follower will always be able to attack even if you run out of mana (which happens quite frequently when you use Divine followers). Additionally, some people were having trouble with the decimal points, so I multiplied all of the stats (except mana) by 10. And lets face it, dealing 25 damage sounds a lot cooler than dealing 2.5 damage anyways! 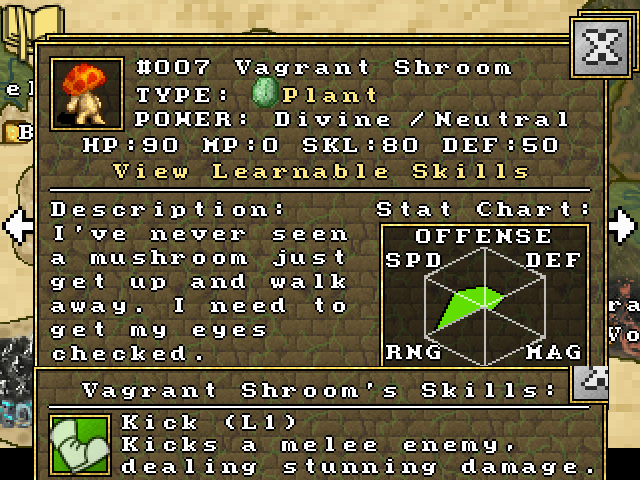 Vagrant Shroom 2.0 - now with more kick! If you already bought Deity Quest, I strongly recommend you update to v1.1.4 - don't worry, your save files will still work (just make sure you copy over your saves directory or use the DQDB save upload). To update, simply re-download the game from the site where you purchased it. I hope you enjoy the update! And if you're not quite ready to buy yet, you can download the Deity Quest v1.1.4 demo on our IndieDB page!